Bt Soft Plus is designed to protect the dog’s elbows in cases of hygromas, sores and calluses. BT SOFT PLUS is fitted with comfortable replaceable padding. The brace is also ideal for use in the presence of conditions such as arthritis, arthrosis or elbow displasia. This is because the compression it provides increases the blood pressure in the area, thus raising the temperature and reducing the pain caused by the conditions. 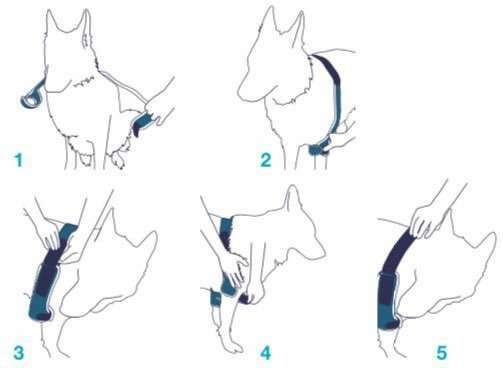 It is also perfect for containing post-operative dressings in direct contact with the skin, such as in the case of surgical operations on dogs suffering from bilateral sterile inflammation of the olecranon bursa. Great freedom of movement as the dog races towards rapid recovery: that is the promise of a brace with such excellent performance as the BT Soft Plus. The comfortable replaceable padding combines convenience, comfort and excellent stability. BT Soft Plus is a loyal friend for your dog’s health. The box contains two spare pads.